Our skin is probably one of the most used and abused parts of the body. Aside from its everyday exposure to the heat, dust, smoke and even chemicals, we often overlook the more simple ways to maintain its suppleness and radiance. One of the ways to help and care for our skin is by regularly exfoliating. This is the process of removing dry and dead cells on our skin’s surface using friction to help it breathe and helping with restoring its glow and youthfulness. This is usually done before taking a bath or a shower. Even the most delicate skin needs slight or moderate exfoliating too. Though you may notice blemishes on the first few scrubs, it’s a sign that your skin is getting rid of impurities. As your skin becomes renewed, it will soon be able to tolerate more vigorous scrubs. Exfoliating our skin once a week can be a way of preventing the occurrence of skin conditions or skin problems since toxins are eliminated. Also, regular exfoliating can help the skin become less delicate. Here are 6 great reasons why we should be encouraged to exfoliate our skin. It may bring about a more even-toned complexion. It can help to break up hyperpigmentation or dark spots and areas in the skin brought by our genes, hormones and ageing. Aside from unclogging and clearing the pores, it can help maintain the pore size, especially on the face. It can prevent too much oil on the skin’s surface and may help preserve moisture through the emergence of new skin cells. It assists in maintaining a smoother and healthier skin surface. It fosters better blood circulation from the heart and the vital organs and parts of the body. Begin exfoliating with the arms and legs in a circular, upward motion towards your torso. 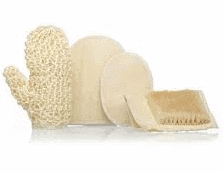 You can use some useful exfoliating tools like fibre gloves, a loofah, mesh sponge and natural bristle brushes. Natural exfoliating base products like dead sea salt, raw sugar and oatmeal are some of the best exfoliants you can use. With your chosen base you can add a little carrier oil and a few drops of your favourite essential oil until the mixture you have forms a paste which can then be easily applied to the skin. Or use our ready made dead sea salt scrub.